From the forest, a vast boreal civilization, our family obtained our Christmas tree this year. As the kids went in one direction to hunt for options, but instead delighted themselves in sledding down a hill, I ducked, bowed, twisted, and turned through a tangle of alder. I was scouting a clearing, where the few balsams within would be assured of ample light, before dragging the entire family on a wild goose chase. Remarkably curious chickadees frittered about and trumpeted my arrival as they welcomed me into their kingdom. The morning had dawned cold, clear, and crisp. The wind was but a wisp. Sunlight, arriving at an angle from an eight minute journey through space, brilliantly illuminated hexagonal crystals of ice and snow adorning the delightful glade. Eight inches of snow blanketed the landscape in further beauty, but did not impede easy travel. Beguiled, as if by a trance, I shuffled toward a promising balsam. Suddenly a grouse flushed, startling me back into reality. It seemed as if he had been guarding the tree, but perhaps I had simply been allotted three minutes of magic. The portal was now closed. I was grateful for the temporary glimpse that such enchantment provides. I hadn’t sought it out. It had found me. I had simply shown up. Such is the case in many areas of life it seems. My family is in a time of great upheaval. A crisis perhaps. The loss of my job has created uncertainty to a degree that was previously unknown to our children. My wife and I hunger for these simple family experiences that remove our eyes from our own problems. 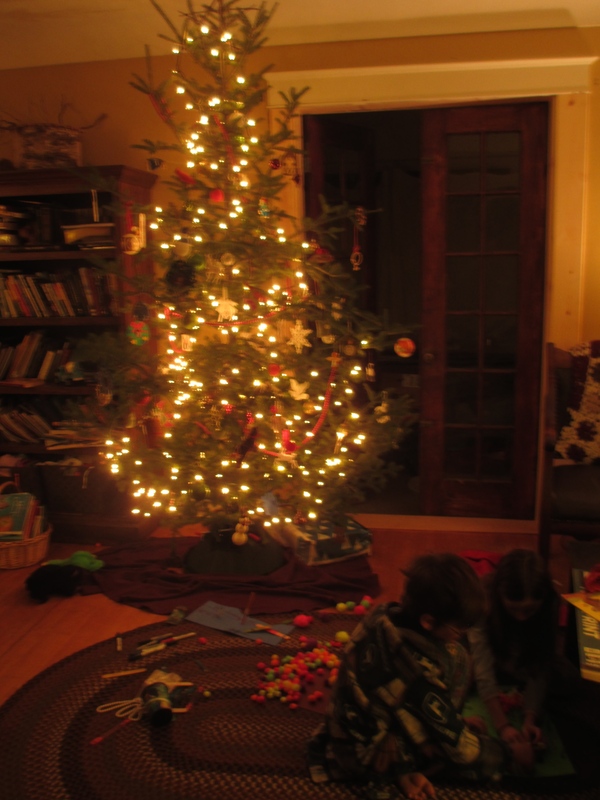 As the Christmas tree points up, so we wish to keep our eyes and souls from being downcast. We can see that this is a decisive turning point in our lives. Nothing is assured. The wheel of time continues to obliviously grind on. Reserves, like shriveled potatoes in the basement, are called into service. My words often exude an ebullient optimism, but after a while there’s only quiet. Thoughts ricochet and linger throughout the cranium, casting darkness and doubt. It is good for faith to be shaken once in a while, so as to wipe out a creeping smugness, but I pray it is not found to be wanting. Out of necessity, we are celebrating the holy day with a minimum of consumerism. This is a blessing. My hope is that the kids will forever look back fondly on this time. A bright line delineates needs versus wants. Since my children are exposed to very few advertisements on commercial television, their wish lists are remarkably small this year. However, one lapse in judgment found us watching videos of a certain toy. This produced “The Gimmies” to a startling degree. This makes me think of our trick-or-treating experience this year, and specifically the morning after. Our daughter beamed with excitement. Due to various food sensitivities she is deprived of nearly all “treats” that other kids engorge themselves upon. With a twinkle in her eye, she held one or two treasures that contained no dyes or other junk that we disallow. Rather than bemoaning an unjust situation, she exuded profound gratitude from every pore in her body. Years of struggle, limits, and deprivation if you will, have a way of promoting thanksgiving in a way that abundance cannot. Too much stuff leads to a sense of entitlement and greed. So, here we are. This situation must not be wished away. It will produce great good in all of our lives if we will only allow it. Contentment and delight should accompany all of the circumstances we find ourselves in, even if the path leads to poverty. The mandate is to avoid the sense of isolation that creeps in during such times of life. I battle it every day. Being around people who are successful in business, and for whom parenting seems to come more naturally, can be difficult. An inferiority complex unexpectedly springs to life. This is a lie. We are all imbued with the divine spark so beautifully depicted in the ceiling of the Sistine Chapel. The challenge is to simply show up. Keep the faith. Keep moving forward.